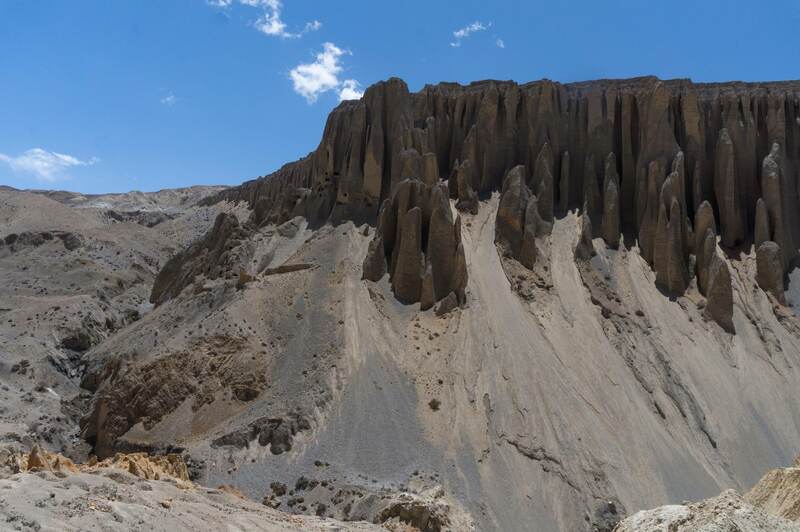 Our walk up the Kali Gandaki Valley to Tsarang from Jomsom had introduced us to upper Mustang’s wow-inducing geology and the structures – both ancient and more recent – of those who have made the valley their home over the past two thousand years. 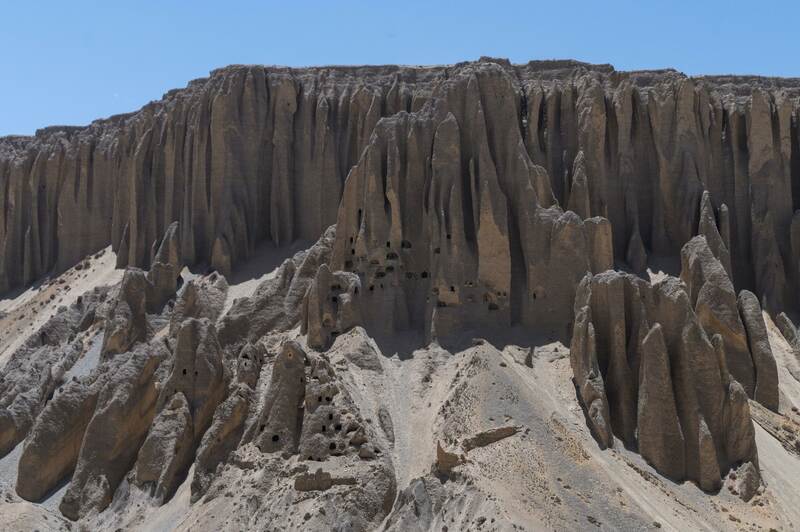 Hundreds of “sky caves” high up in the sandstone cliffs, dozens of chortens on the trail, and in the villages there are gompas and dzongs and mani walls to check out. We had one more day in this world before heading east on the pilgrims’ trail to Damodar Kunda, a set of three small “lakes” with karma-absolving properties that compels the occasional intrepid Hindu to make the difficult journey. We follow the main trail for approximately 2 hours. 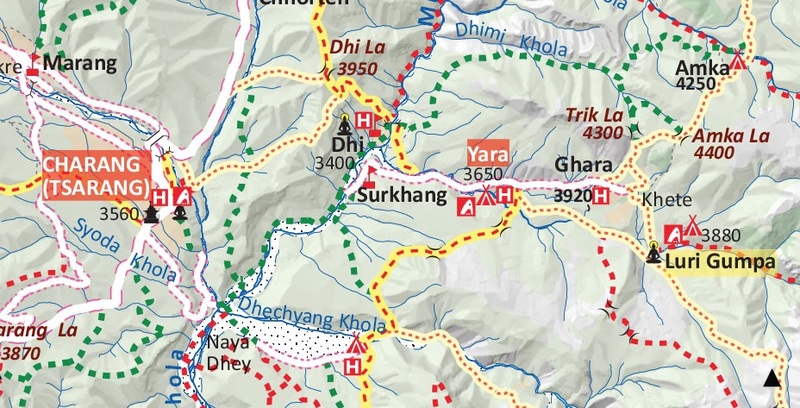 We turn right and head downhill for another 2 hours and reach our lunch camp at Dhi. 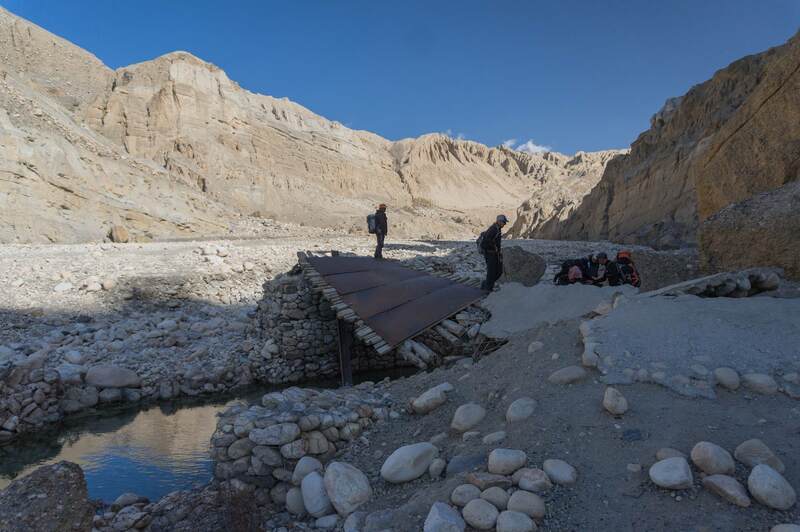 After lunch we cross a suspension bridge which is above the Kali Gandaki River. 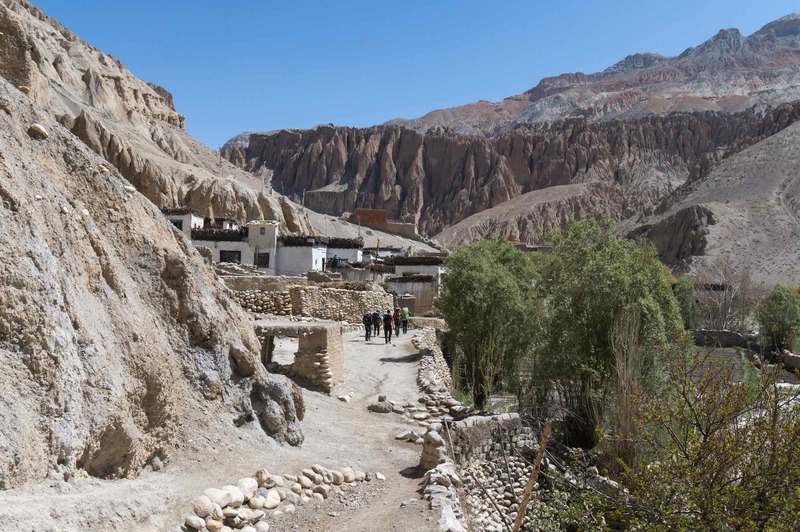 We arrive in Surkhang and then follow a narrow valley to Yara village. This is a unique area where we find ancient caves set into stone walls. 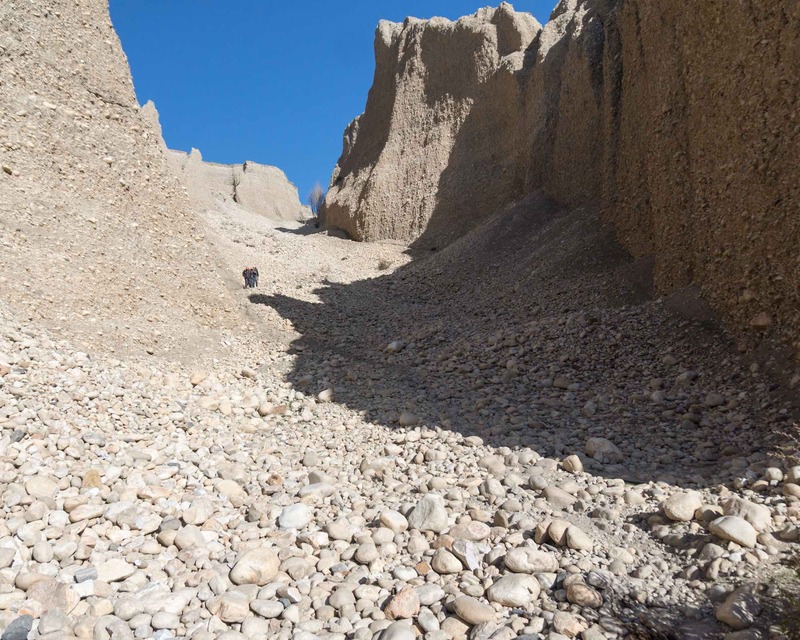 Instead of following the main trail north of Tsarang we headed down a gully to the south of the monastery and were soon walking along the Tsarang Khola. (See the satellite map above for the approximate route.) 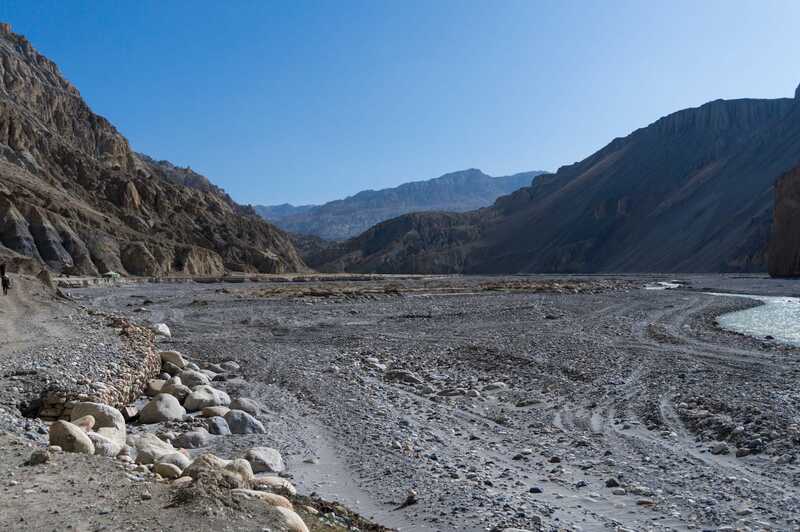 At the confluence with the Kali Gandaki, we turned left and walked up the broad dry river bed to Dhi. 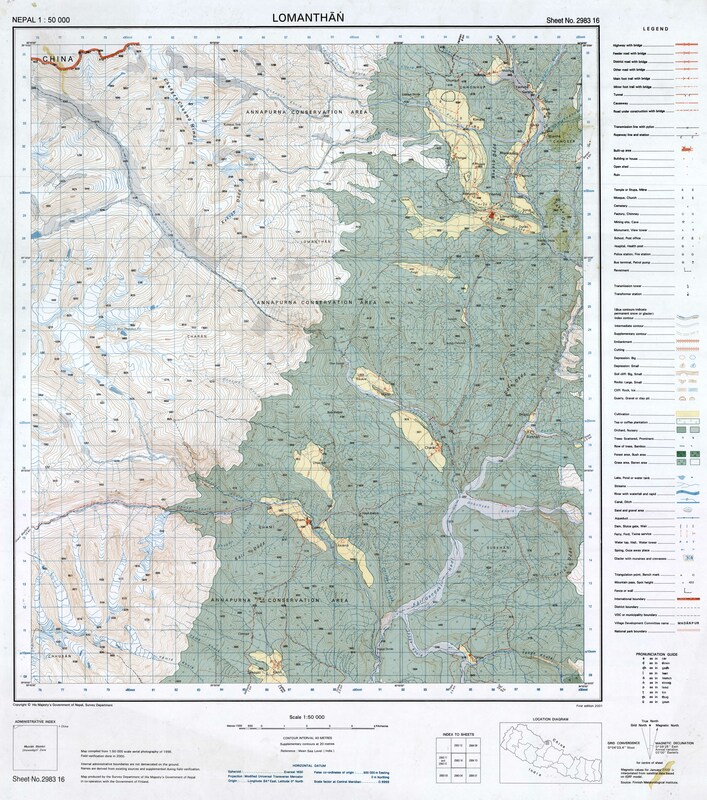 We never did arrive in Surkhang since we bypassed it both approaching and leaving Dhi. 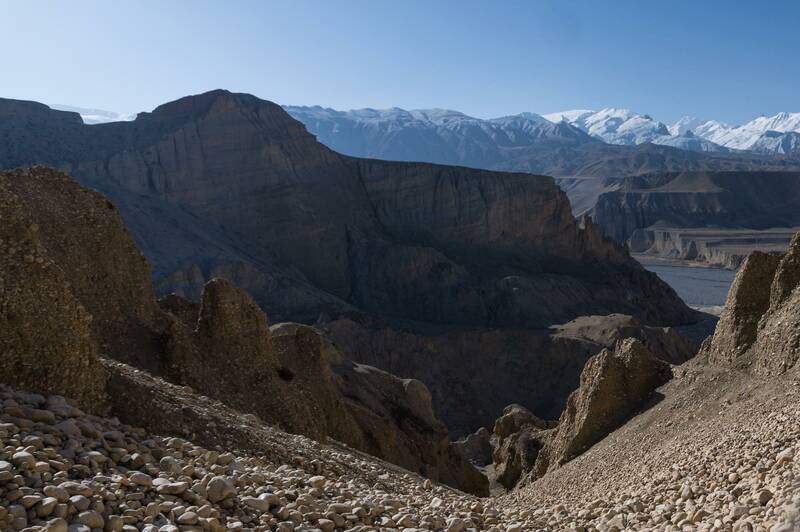 The walk up the west side of the Kali Gandaki was memorable for the incredible rock formations we passed. Thanks to the morning sun and the deep shade on the east side my attempt to capture some of the magic was not a success! 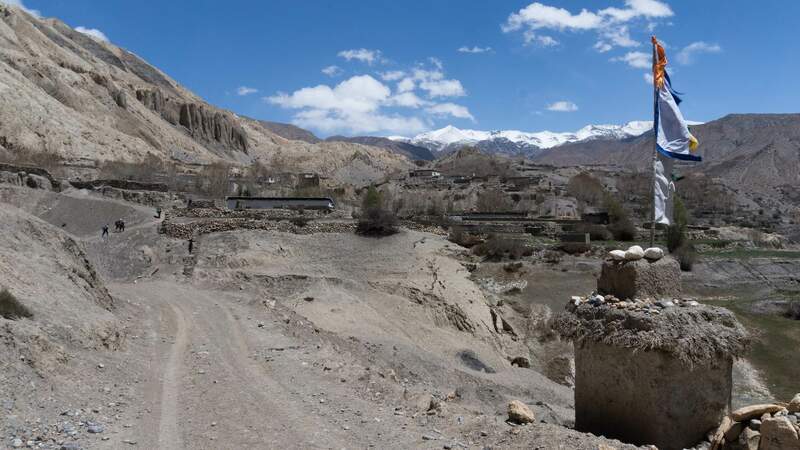 Entering Dhi – sometimes with gao or gaon meaning “village” attached it its name – was like coming upon an oasis. 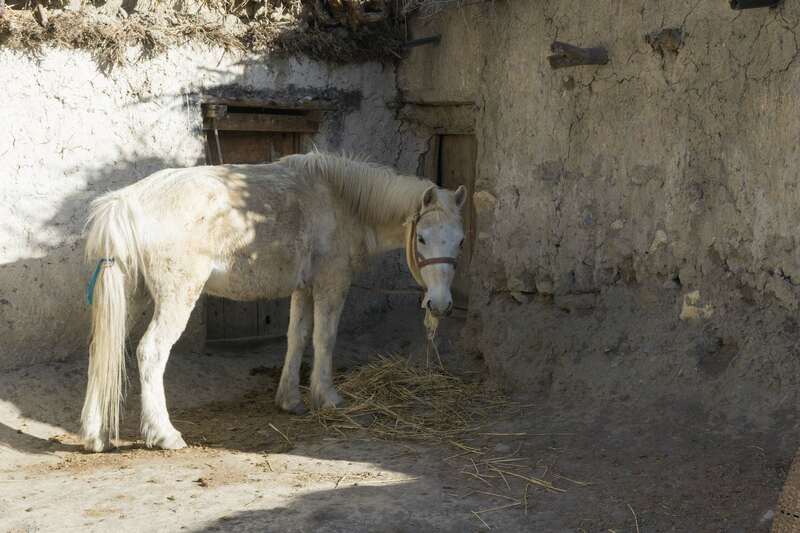 Fifteen or twenty households, most relying on agriculture, make it their home. 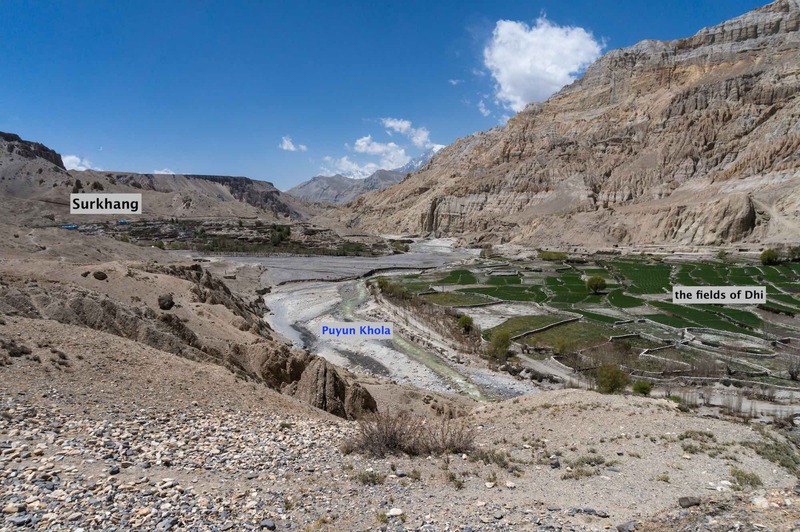 Fields of lush green spread south from the village to the Puyun Khola; on its east side is the Kali Gandaki with its promise of water later in the year. 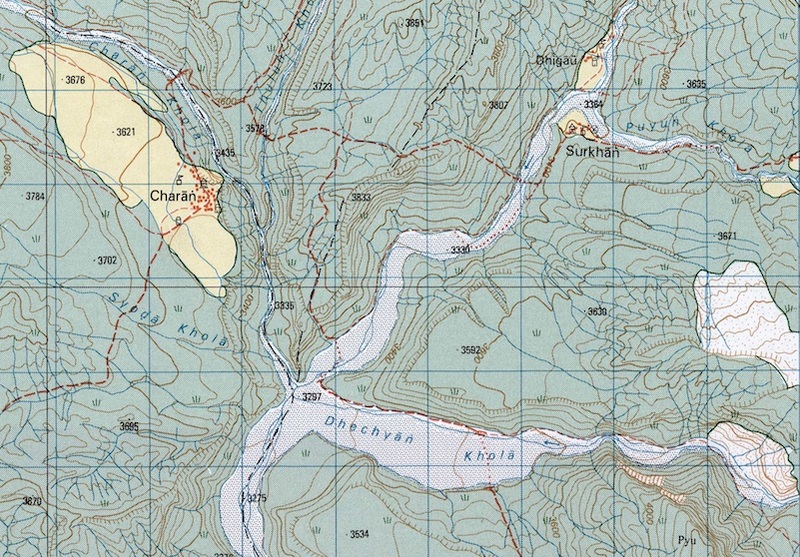 On the south side of the Gandaki/Puyun confluence sits Surkhang, a somewhat smaller settlement. 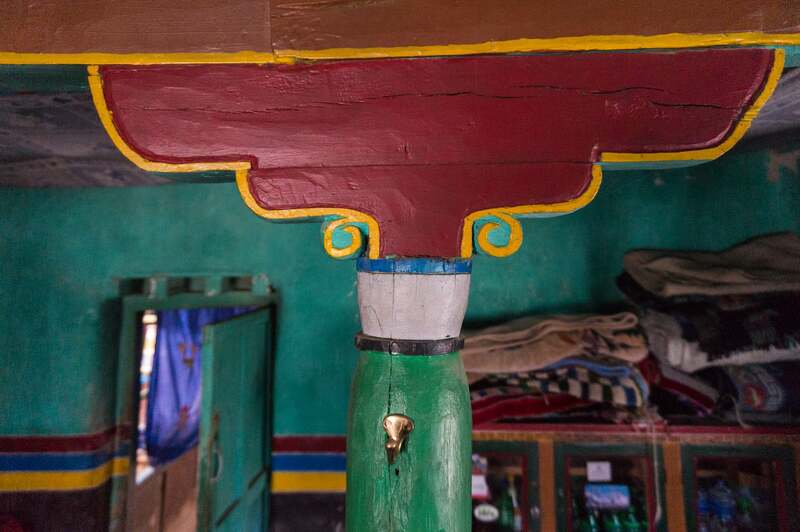 We were headed to the Hotel Potala, one of the two or three guesthouses in the village where a dining hall on the second floor was ready for our use. While waiting for the cook team to get things ready I struck up a conversation with the owner. 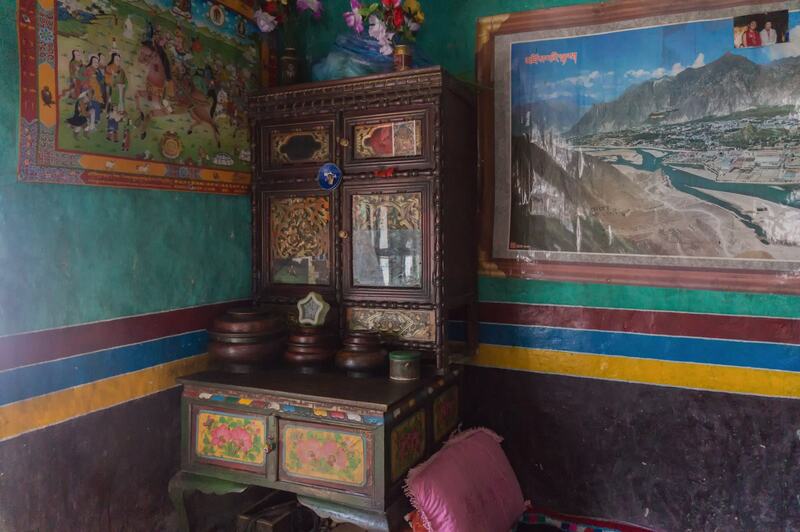 We talked for a while about the village and his hope for a few more guests as the Tiji Festival up in Lo Manthang approached. Then he asked if I wanted to see the family shrine room, an offer I much appreciated. Among the statues, thangkas, and pictures of lamas, I noticed the words “Dehra Dun” on a couple of them. I tried to make clear the connection after I returned home with a bit of internet research. I learned that the lama Trichen Jurme Kunzang Wangyal (1935-2008) had fled Chinese-occupied Tibet in 1959 along with a number of other monks from Tibet’s great Nyingma monastery at Mindrolling. In 1962 he was chosen the eleventh Mindrolling Trichen. Dehra Dun was to become the location of a new Mindrolling Monastery and he spent much of his time there. Unfortunately none of the online images of the 11th Trichen look like those I think I saw (I took no photos) in our host’s shrine room! To complicate matters it turns out that Dehra Dun, like Dharamsala, is a major Tibetan refugee center and it has monasteries belonging to other Tibetan lineages too. So my attempt to figure out what lineage our host belonged to was a failure. 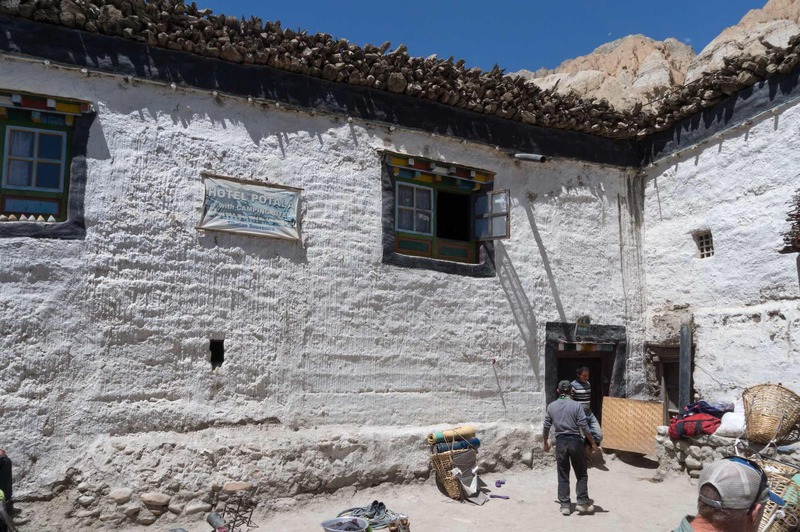 However, as at every shrine in upper Mustang, there was a photo of a lama I did recognize – that of the current leader of the Gelugpa sect, the Dalai Lama! 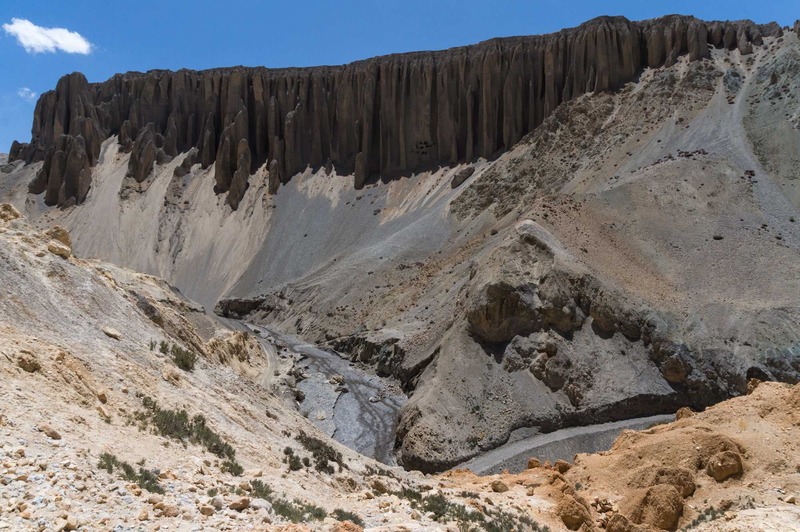 After our early lunch we were back on the trail and, as the images below hopefully will show, were presented with some excellent photo ops of the dramatic landscape we were traversing on the way to Yara. There were yet more caves dug out of the cliff sides. 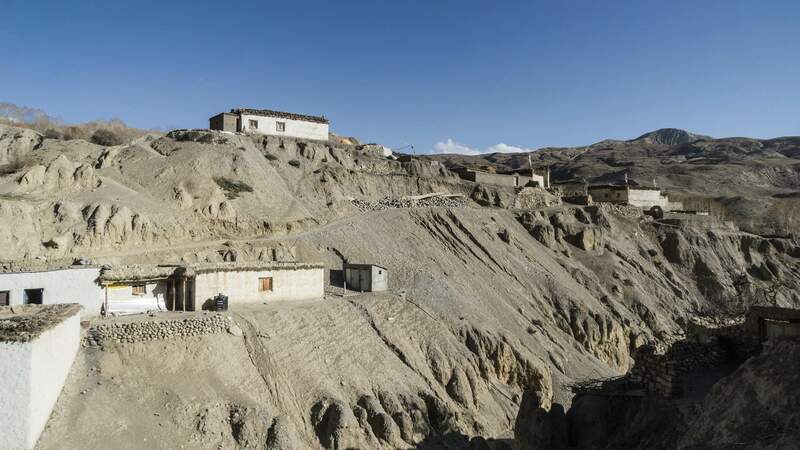 Some were used as burial caves by a little-known culture that may predate the Tibetan Buddhist one by a thousand years. 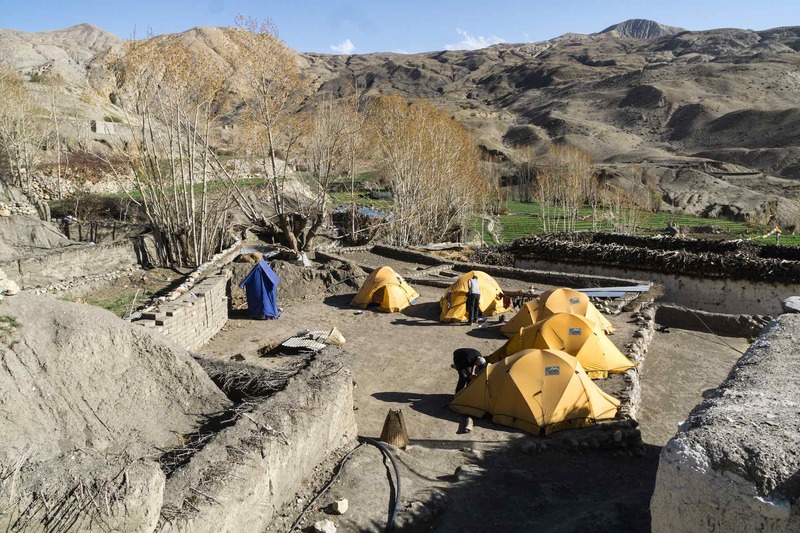 Others may even have been shelters and later used by monks as temples or retreats. 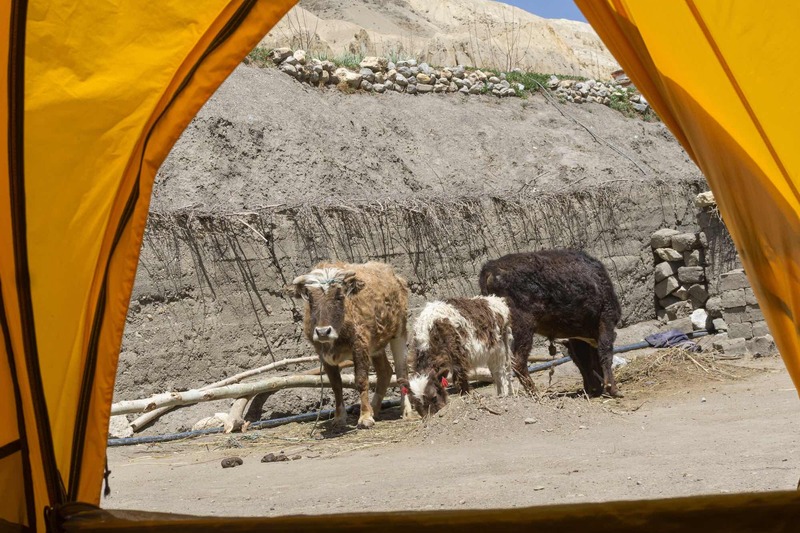 The next day we would visit two such temple caves, the ones at Tashi Kabum and Luri Gompa. We could only look at the others and wonder if anyone had checked them out and what they had found. 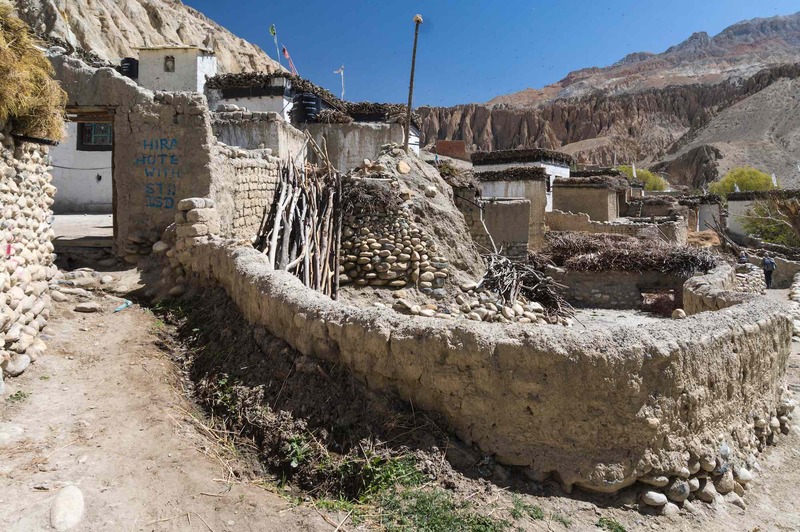 Yara would be our last village for seven days until we walked out of Mustang and came to Phu on the other side of the Saribung La. 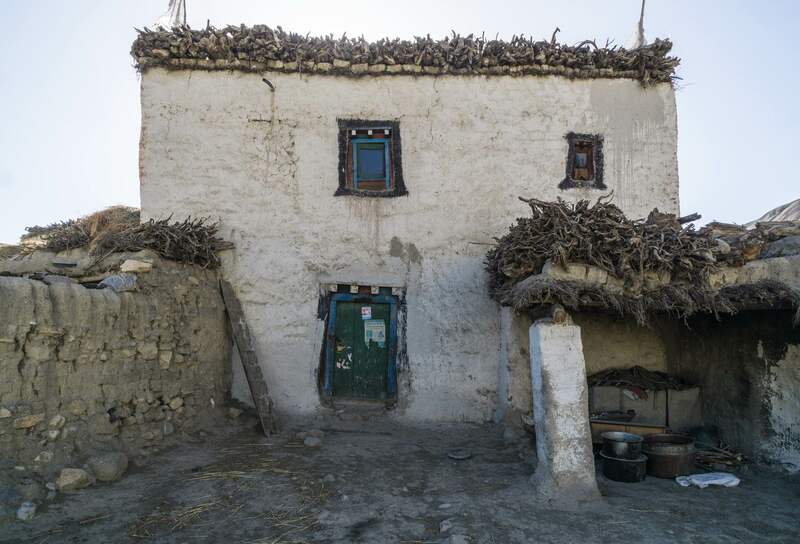 It has three or four guesthouses. Ours was the one with the dramatic view overlooking the village. In the image below it is the white building just a bit up from the very center. 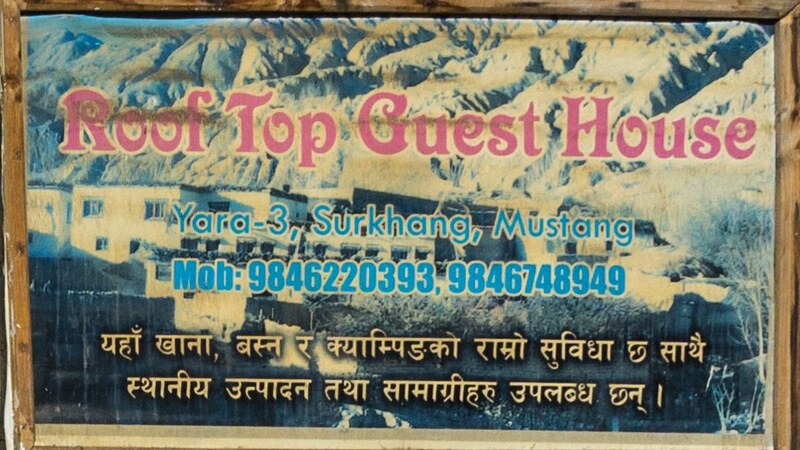 Rooftop Guesthouse is a fitting name! As we had the previous five days, we made use of the guesthouse’s dining room and toilet facilities. Next to the building was a walled-in animal pen which would become our camping space in the evening. For a part of the afternoon, we shared it with the three locals leashed to a metal post not far from my tent door. 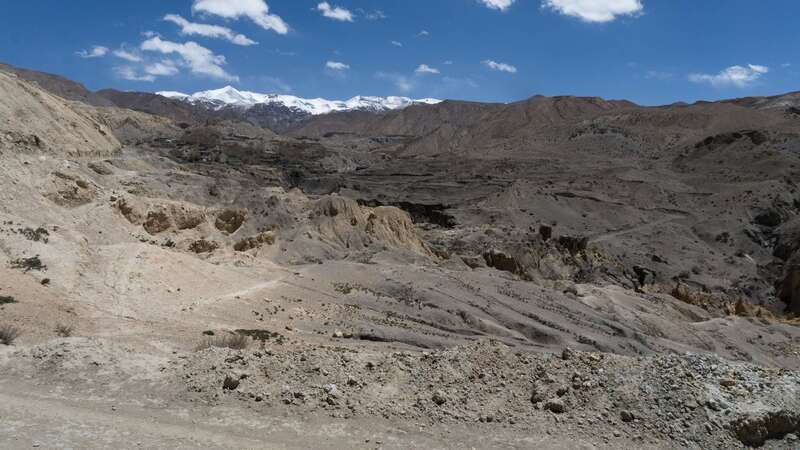 We were now at 3650 m. – just 100 meters higher than the day before at Tsarang. 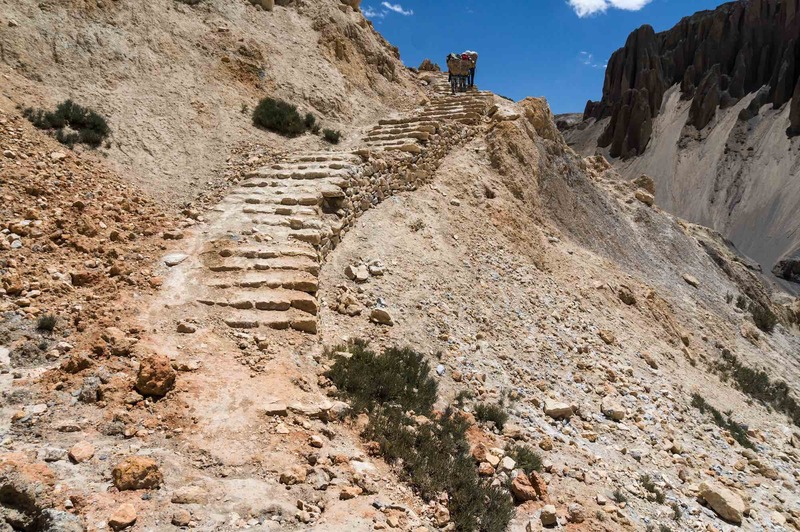 Always in the back of my mind was Saribung La at 6040 – now the high pass was just seven days away. So far no one had any acclimatization issues and I hoped my body would have enough time to adapt.